An attempt to answer the question of Static vs. Dynamic Methods which states "All procedural methods are necessarily static." Static Procedural Methods theorem was formulated by Hakob Barseghyan in 2015.1 It is currently accepted by Scientonomy community as the best available theory on the subject. Aristotle and his successors assumed a method by which axiomatic proof could guarantee absolute certainty about the world. Rudolf Carnap and the logical positivists attempted to axiomatize scientific theories, and therefore apply a universal method of logical deduction in their form of inductive verificationism. Contra the positivist approach, but still assuming a universal and static characteristic of method, Popper introduced a falsificationist method of science.3 This method rejected ever achieving absolute certainty in the truth of a theory, but Popper and contemporaries nonetheless assumed that this falsificationist method ought to have, and in fact had, applied to all scientific communities across time and space. The particular differences between each method are elaborated on the page on Method, but it is due to the assumption that their own explicated procedure of theory acceptance applies to all scientific communities that these philosophers can be characterized as subscribing to a Static Methods theorem. More recently, the debate between Laudan and Worrall4567 elucidated the distinction between two questions about static methods. First, an empirical question: have there been any methods which have not changed through history? And second, a theoretical question: Are there any methods which are, in principle, immune to change? Both Worrall and Laudan agreed that there exist substantive methods shaped by contingent proposition and therefore not static. However, Laudan held that no methods have ever been procedural — shaped by only necessary propositions and therefore immune to change — whereas Worrall contents that certain methods, such as the hypothetico-deductive method, are in fact procedural and historically have formed the base of scientific reasoning. Static Procedural Methods theorem (Barseghyan-2015) is an attempt to answer the following question: Are there any methods which are immune to change? A procedural method is a method which doesn't presuppose any contingent propositions; it can only presuppose necessary truths such as those of mathematics or logic. Given the nature of necessary truths, it is impossible for one such truth to contradict another necessary truth since it must be true in all possible worlds. Therefore, it follows from the Method Rejection theorem that, since there can be no elements at odds with a necessary truth, any procedural method is, in principle, static. This theorem explains why all procedural methods are necessarily static. By definition all procedural methods don’t presuppose contingent propositions but only necessary ones. 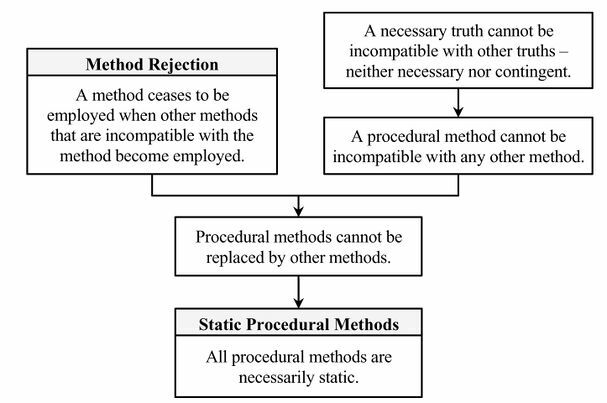 Thus, from a conjunction of: 1. the Method Rejection Theorem (derived in turn from the First Law for Methods and the Zeroth Law or Law of Compatibility), 2. the premise that no procedural method can be incompatible with any other methods, either procedural or substantive, and 3. the premise that procedural methods cannot be replaced by any other methods, it follows that all procedural methods are necessarily static. Can a procedural method be replaced by another procedural method? No, because procedural methods only presuppose necessary truths and by definition they cannot be incompatible with each other, as they hold in all possible worlds. Therefore, no procedural method can be incompatible with or replace another procedural method. For example, a newly accepted mathematical theorem that has been derived from other accepted and necessarily true mathematical propositions gets accepted into the mosaic (by the Second Law). This theorem in turn can lead to a new procedural method, but this method cannot be incompatible with the other employed methods, for the same reason the theorem cannot be incompatible with previously proven theorems. Can a procedural method be replaced by a substantive method? No, because substantive methods, by definition, presuppose at least some contingent proposition while procedural methods only necessary ones, which are compatible with any truth, whether contingent or necessary, already accepted into the mosaic. Therefore, no substantive method can be incompatible with or replace any procedural method. For example: if the deductive acceptance method, whereby a propositon follows deductively from other accepted propositions, were not to be accepted, this would imply a violation of the very definition of deductive inference, according to which truth is transmitted from the premises to the conclusion. This page was last modified on 1 April 2018, at 21:02.